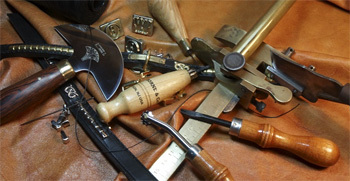 Slade Czech custom-made manufacturing, mainly of dog collars and leads, is based on quality hand processing. By using high quality material, we guarantee the satisfaction of the most challenging requirements regarding the aesthetics and quality of the products, and in addition, thanks to the quality processing, wearing the collar is pleasant and doesn't damage the dog's fur. The collar may not choke the dog and, on the other hand, it shouldn't slip off by itself. It is always necessary to make sure the collar is firm enough and safe for the given breed. During manufacturing, we utilize our own experience and traditional procedures, which are constantly being improved. Using our imagination, sense of detail and necessary skill, we give the traditional material a non-traditional look. We specialize in collars and leads for bull type breeds, especially for the Staffordshire Bull Terrier, we are however able to manufacture a collar for any breed according to individual requirements. Based on years of experience, we are able to satisfy the most challenging requirements of our customers. Our products have enjoyed popularity with dog-breeders from all over the world for many years.